I know what you’re thinking. BUT, homemade toothpaste really isn’t that complicated. In fact, toothpaste is really a simple concept. It’s a paste – you put on a toothbrush – to clean your teeth. For some reason, we’ve outsourced toothpaste making to the large food giants, when in reality, homemade toothpaste is not only super easy to make, it works really well, and is way more affordable than the conventional stuff. In short, I think you’ll be pleased with the homemade toothpaste recipe below. What’s in the Homemade Toothpaste Recipe? The abrasive of this homemade toothpaste recipe, baking soda, neutralizes excess acids, and removes plaque, whitens teeth and helps to maintain healthy gums. Dr. Bronner’s Liquid Castile Peppermint Soap is an organic, natural, vegetable-based soap that adds some flavor and suds to this homemade toothpaste. I’ve found adding it to the recipe gives Mr. Coconuts and I the foamy texture we once experienced with conventional toothpastes, and enhances the peppermint flavor. Peppermint oil, the flavor agent of this homemade toothpaste, gives the paste a pleasing and cool mouthfeel. While peppermint oil does have some antibacterial and antiviral properties, its main purpose is to freshen breath. And lastly, the optional natural stevia powder is for those who like sweeter-tasting toothpaste. Personally, I leave it out because I do not care about the taste – but, it’s a good option for those who are transitioning, or who have family members who aren’t an easy sell. Conventional toothpastes contain a whole bunch of added unnecessary ingredients, many which should not be going into your mouth. The most unfortunate of these include sodium lauryl sulphate, a known skin irritant, triclosan, which is linked to cancer and endocrine disruption, and fluoride, which is also linked to cancer and thyroid dysfunction. Many other common ingredients, including propylene glycol, artificial colors, and certain un-pronounceable substances are synthetic compounds that are not natural, and shouldn’t be in the human body. Soften the coconut oil so that it is pliable. You may be able to do this by simply whipping the coconut oil with a spoon. Add the baking soda to the coconut oil, and stir well. Add the peppermint oil, Dr. Bronner’s soap, and stevia to the mixture, and “whip” with a spoon until well combined and fluffy. Put mixture into a wide mouth glass jar, like a Weck jar or a small mason jar for storage. To use this homemade toothpaste, simply wet your toothbrush, and use a small spoon, like a 1/4 tsp measuring spoon, to place the toothpaste on your toothbrush. Note: When making your homemade toothpaste, try NOT to melt the coconut oil so that it is completely liquid. If you do this, as it cools, all the baking soda will settle at the bottom and will require “re-whipping” as it cools. Another Note: If you choose to leave this toothpaste in an open glass container like we do, it will get slightly dry over time. To revitalize it to its original consistency, simply add a bit of water and re-whip. Does this toothpaste work? Yes. Mr. Coconuts and I, as well as many other people I know have had success with this toothpaste. I’ve never gotten a cavity, and my oral health is superb. Does this toothpaste taste good? Folks, this is toothpaste, not chocolate. While it DOES taste refreshing and is plenty palatable, it’s different from conventional, overly sweet and sudsy toothpastes. Give yourself a few weeks to get used to it. You can do it, I believe in you. Isn’t baking soda too abrasive? No. Baking soda is less abrasive than most conventional toothpastes. Where should I store my homemade toothpaste? Right beside your bathroom sink, of course! I choose to leave the top off, and my spoon applicator in the mixture for easy access. I don’t want to make my own toothpaste. What are my options? I recommend checking out my two favorite toothpastes I take with me on travel — Earthpaste and OraWellness. 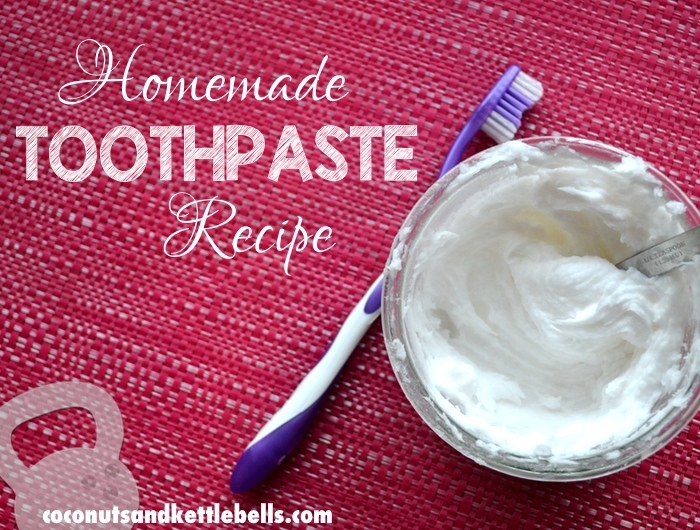 I’d LOVE to know how this homemade toothpaste recipe worked for you. Come back and let me know your experience or questions you have below! I’ve been thinking of making my own toothpaste, and this looks like the perfect recipe. It’s SO easy Beth. 🙂 Let me know how it goes! Is this safe for a 1 1/2 and 3 year old – I wouldn’t put in the soap or peppermint?? Hi Lauren! I’d hold off on the peppermint essential oil since it’s said to be not safe for children under 30 months. However, the Dr. Bronner’s should be absolutely fine as it’s a vegetable based soap and it only includes safe ingredients. It’s definitely safer than any of the conventional toothpastes on the market! 🙂 Some people use Dr. Bronner’s straight as a toothpaste, but it’s not that palatable to me. This recipe, however, tastes much better! Hope that helps! Can I use Branch Basic’s soap in place of the Dr. Bronner’s? Hi Aimee! Just checked out the ingredients, and it looks great! All plant-based, and very similar to Dr. Bronner’s in terms of their philosophy. I don’t use Branch Basic’s personally, so I can’t tell you how much to use – but I can say I would feel comfortable using it! 🙂 Thanks for your comment! Wont the toothpaste become liquid in summers ?? I just made your toothpaste, face wash, and toner recipes! Quick question–can I use the tooth paste in the morning and at night? I know with the face wash I only use it once at night. Thank you, and I cannot wait to try these!! Just a little testimony for you! I began using this recipe for my toothpaste almost a month ago, and boy, have I been impressed! I had a sore tooth/gum area for about 6 months and unfortunately did not have access to a dentist during my term of service with AmeriCorps. I wanted to look for a better alternative than regular crest toothpaste. I can say that my sore tooth is almost completely healed, my teeth are whiter, and my breath is fresher. I will be using this toothpaste for the rest of my life and I encourage others to do so! Where can…Dr. Bronner’s Liquid Castile Peppermint Soap….be purchased? I am wondering about the safety of spitting the toothpaste down the drain. I do oil pulling and everything I have read says the oil shouldn’t go down the drain do I am concerned about causing plumbing issues. Do you have any insight? Thank you so much! Hi Kendra! We personally haven’t had any troubles after the years we’ve used it – both in our bathroom, and in our kitchen. We do clean out our bathroom sink drain every 6 months or so, and always run hot water after rinsing. Get some more tips here. I’ve been thinking about making my own toothpaste recently and I just happened to find your recipe today. Guess it’s time I get started. Do you recommend a certain baking soda? Hi there! I live in Thailand where there is no Dr Bronner’s. What can I replace it with in terms of natural ingrediants or a simliam type product for that sudsy effect? Wish I could help – but I don’t know what products are available in Thailand! So sorry! Hi. Can you order the Dr Bonners online? Love those ideas! Thanks for sharing! Wow! I’m really surprised to see that coconut oil is really effective and I had no idea! I’m really excited to try this recipe out. I’ve never made my own home made tooth paste before. This will be a great way to cut back on costs and hopefully cut back on visits to the dentist. Thanks for the great post! I make my own toothpaste with coconut oil, also with baking soda, cinnamon, Himalayan salt, clove oil, activated charcoal and bentonite. My Dentist approves. He says the salt is great for stimulating saliva and enzymes. Does the peppermint oil have to be the edible kind? Is Dr Bronners soap really ok for oral use? Also I read that adding xylitol is good for reducing cavities. I’m in the UK so sometimes hard to get the same products. I have a different brand peppermint essential oil which should be ok, and can get hold of the Dr Bronners, thank you so much. Hi! 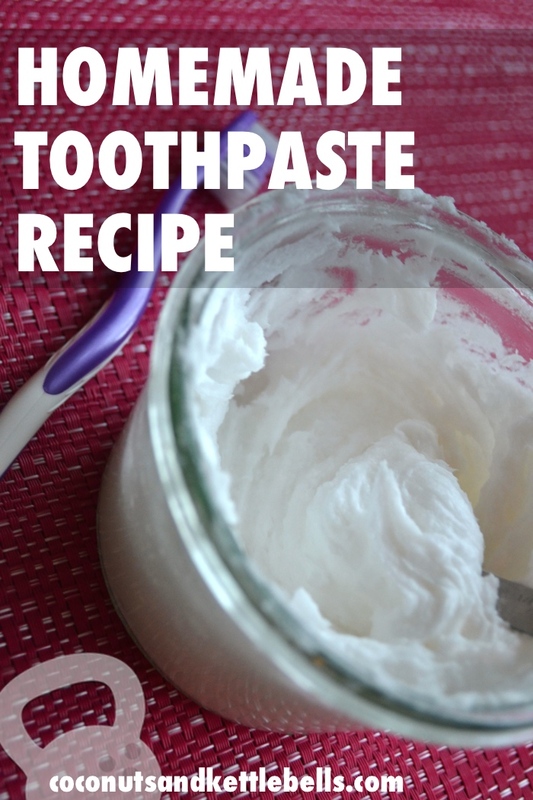 I was looking for a homemade toothpaste recipe and found this and i think its great± Although i have a question – I am finding a really weird and unpleasant taste from it which i think is the castille soap…is there something i can do to make this better…?! i want to switch to it for good but the bad taste is making it hard! I didnt add stevia perhaps this is why…or perhaps is is the castille soup necessary? The soap is NOT necessary… however, I find it gives the toothpaste a very nice “sudsy” texture. So, you can leave it out! I find that totally odd, though. Are you using just a tbsp, and is it the Dr. Bronner’s peppermint flavor? Hope that helps! Just whipped this up to try! So excited. Ok, I just want to provide an update. So, I had a dentist appt 8 months ago. Things were fine. I began using this toothpaste about 3 months ago. Things felt great. My teeth had never felt so clean, never looked so white! I loved loved loved using this. Well, today, I had another dentist appt. I went in there, not telling them about my new toothpaste, just to see how my teeth were doing. The dentist immediately looked at my xrays & says “Okay, there’s a cavity… there’s something there, & there, & there…” Turns out, I had a cavity & several other spots that could, potentially, be cavities. I was devastated. I really was so pumped to have a natural toothpaste, that seemed to be doing such a wonderful job. I still will use the coconut toothpaste, but it will be before my regular toothpaste, just to keep the whitening factor. Hope this works for others, but make sure to check in with your dentist after a bit. Hi Ashley! So sorry to hear about your experience. I do have to say, cavities are not caused by switching to a natural toothpaste. A toothpaste is simply an abrasive, and using a toothpaste that uses baking soda or clay as the abrasive is just as effective as something a company would make in a factory. Furthermore, 3 months of stopping brushing your teeth altogether would not result in multiple cavities. I hope this helps, and gives you some encouragement. I would highly recommend looking into more about the root of why cavities form (mineral deficiencies, and MOST importantly, deficiencies in fat soluble vitamins, like vitamin K2 and Vitamin D which help the absorption of calcium.) The work of Weston A Price, who was a dentist in the 1930s, has some amazing literature about teeth and tooth health. He traveled the world and looked at indigenous cultures, and found that they had beautiful, healthy teeth that were straight and strong. This wasn’t due to brushing, or seeing a dentist—because they did neither. It was due to the high amount of fat soluble vitamins in their diet, which tend to be deficient in modern cultures. Hope that helps! Absolutely! It will just have a less pepperminty flavor. What else can be taken than Dr. Bronner’s Liquid Castile Peppermint Soap, as I am not living in the USA, but Germany ? Is there also another ingredient instead of baking soda ? Hi there! You can leave out the soap altogether. The Dr. Bronner’s simply gives it a “suds” feel and more pepperminty taste. As for baking soda, no. You’ll need to use it as the abrasive. Hi Tanja! Fillings are not my specialty and I can’t provide any insight on that. I can tell you baking soda is very low on the abrasion scale, which it why it is used in this recipe. I am sure there are lots of other recipes you can find with a google search if you want to use clay. Good luck! Hi, my kids loves to eat their toothpaste so this is an excellent idea but I live in the tropical so coconut oil is at its melted form. Do you have any other suggestions? What kind of mouth wash do you recommend after oil Pulling before or after brushing your teeth? Thanks Deborah. Hi Deborah! I don’t have a specific mouth wash that I recommend as me and my family personally don’t use it. Does the castile soap will make bubble when we brush? Is it safe for children to use if they swallow accidentally? Thank you. The soap gives the toothpaste a sudsy feel, but no bubbles. I probably wouldn’t use it with kiddos who swallow. Hey! I read your recipe and it sounds really good. However, would it be enough if I only combine the coconut oil and the baking soda together? It’s quite difficult in my area to find the other ingredients. You could do that! It will affect the taste/texture. But if you do that and like it then I don’t see a problem with it. Thanks for your reply! I will be sure to try it out and let you know as well. Is there other thing to replace the peppermint oil? I would still like to have the fresh breath but peppermint oil might to hard to come by. Thank you!